HiR Information Report: Cyber Monday? How about MAKE some gifts? This year, I'm planning on building as many gifts as I can. This is why I was so frustrated with Radio Shack earlier this month. So far, I've got three gifts almost completed, all of which are electronic. 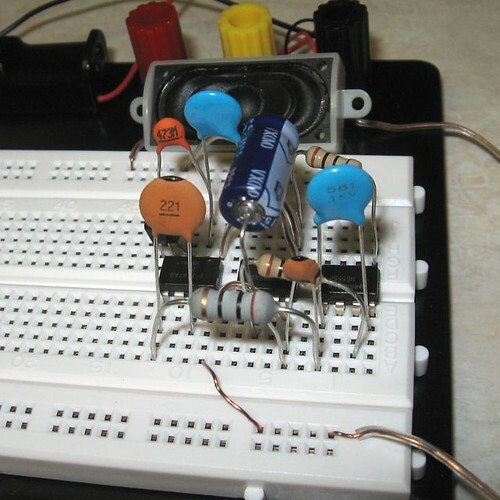 I start with an experimenter breadboard like the one shown*, then go bananas. Once I have something working the way I like it, I solder it to perfboard. There are tons of great ideas in books and online. You can always find cool things to assemble yourself at Evil Mad Science, The Maker Shed, Sparkfun or LadyAda. If you can't solder or don't quite grok electronics, you can try crafts such as woodworking, cooking, leather working, knitting/sewing, or anything else that you put your time, knowledge and heart into. Chances are, it'll mean more to the recipient than a gift card, some clothes, or whatever device you happen to burn your cash on. Maybe donate some of the grip you save to help save lives? Several initiatives are out there to provide clean, drinkable water to those in need. There's local emergency response and hardship relief, hope for cancer patients and a host of other organizations worthy of your help this season. How about less consumerism and more love? Get excited and make things! * The circuit on the breadboard is completely bogus. Sorry, peeps. No clues until December 25th!